Rendering given in the English versions for several words used to designate rush-like water-plants of various kinds. These words are: (1) "Gome"; the Cyperus papyrus of Linnæus. (2) "Suf" (Ex. ii. 3; Isa. xix. 6); identified by Egyptologists with the Egyptian "thof" (Nile reed; on "Yam Suf" as a name of the Red Sea, see Red Sea). (3) "Aḥu" (Gen. xli. 2, 18: Job viii. 11): Egyptian loanword denoting a marsh-grass growing on the banks of the Nile and used as fodder; the translation "flag," based on the Vulgate, is, therefore, incorrect. (4) "Agmon" (Isa. ix. 13, xix. 15, lviii. 5; Job xl. 26; Jer. li. 32 ["agam"]); generally explained as a kind of rush ("scirpus"); according to the "Hierobotanicon" of Celsius, the common reed. (5) "Ebeh" (only Job ix. 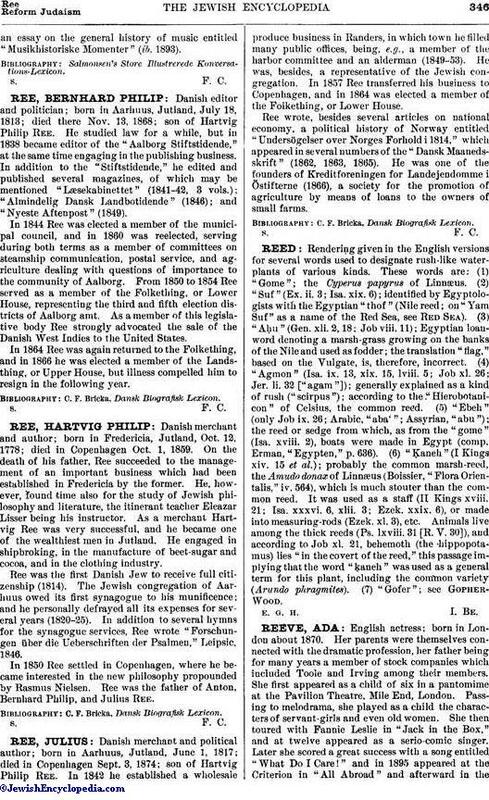 26; Arabic, "aba'"; Assyrian, "abu"): the reed or sedge from which, as from the "gome" (Isa. xviii. 2), boats were made in Egypt (comp. Erman, "Egypten," p. 636). (6) "Ḳaneh" (I Kings xiv. 15 et al. ); probably the common marsh-reed, the Amudo donax of Linnæus (Boissier, "Flora Orientalis," iv. 564), which is much stouter than the common reed. It was used as a staff (II Kings xviii. 21: Isa. xxxvi. 6, xlii. 3; Ezek. xxix. 6), or made into measuring-rods (Ezek. xl. 3), etc. Animals live among the thick reeds (Ps. lxviii. 31 [R. V. 30]), and according to Job xl. 21, behemoth (the hippopotamus) lies "in the covert of the reed," this passage implying that the word "ḳaneh" was used as a general term for this plant, including the common variety (Arundo phragmites). (7) "Gofer"; see Gopher-Wood. E. G. H. I. Be.